I’ve lived in Thailand for quite some time now, making frequent visits to Europe and the US, and feel that my life has become of blend of western and eastern cultures. With this lace knit wrap design I wanted to celebrate that blend, combining elements of both cultures, and chose lotus and rose flower stitch patterns to achieve this. 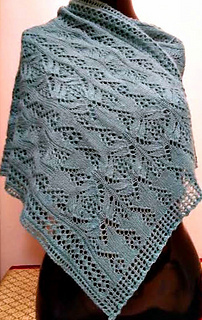 In addition to the lotuses and roses, the design incorporates an open-work lace edging along the sides and Japanese feather stitch panels between the rose panels. 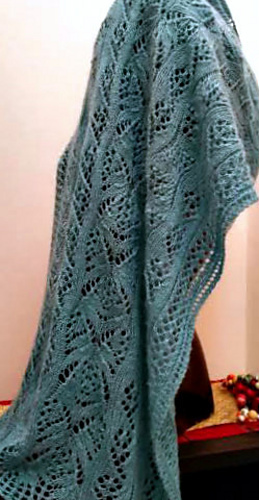 The feather stitch pattern was added to create a series of undulating lines along the length of the wrap. 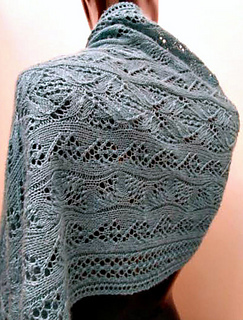 At the end of the main body of the wrap I have included a section that features three rows of flowers –rose, lotus, rose. 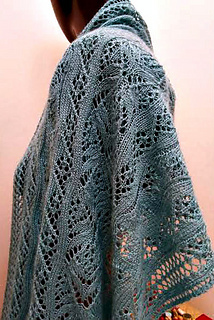 I knit this in 3 skeins (950 yards or a bit less than 900 meters) of a lace weight blend of merino and silk. Note that there are 2 pdf files - one is the written pattern and one is a chart.